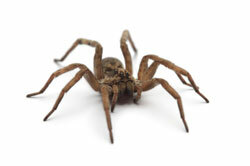 Spiders can be a difficult pest in the home. Their preferred habitat is warm, dark small spaces. Most spiders are a problem because of their webbing. Less than a 1000 species of spider reside in the UK. Spiders can also be beneficial because they devour pests themselves. Some spider infestations will prove exceptionally difficult to contain and the services of a qualified Pestforce pest control technician may be necessary. To deal with spiders where there is a heavy infestation or to get a your free onsite spider pest control quotation, search for your local Pestforce technician at the top right corner of this page.